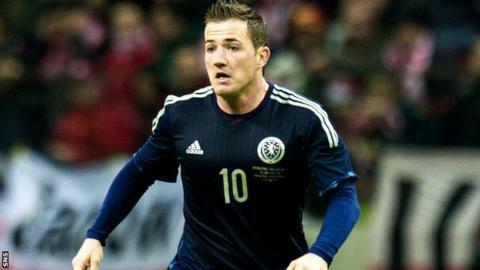 Scotland have called up Fulham striker Ross McCormack and Birmingham right-back Paul Caddis for Thursday's friendly against the Czech Republic. Norwich duo Steven Naismith and Steven Whittaker have both withdrawn from the squad preparing for the trip to Prague. Naismith has a hamstring injury while Whittaker's wife is due to give birth. Caddis' call-up brings the number of uncapped players in the two squads to face the Czechs and Denmark - at Hampden Park on 29 March - to eight. Hibernian midfielder John McGinn, Celtic left-back Kieran Tierney, Aberdeen midfielder Kenny McLean, on-loan Blackburn striker Tony Watt, Nottingham Forest midfielder Oliver Burke, Brighton's Jamie Murphy and Leeds defender Liam Cooper are the other players yet to taste senior international football. Manager Gordon Strachan will use the games to assess some new faces ahead of the 2018 World Cup qualifiers. The Danish squad includes Celtic defender Erik Sviatchenko, Leicester keeper Kasper Schmeichel, former Liverpool centre-back Daniel Agger and Tottenham midfielder Christian Eriksen.